There are particular challenges.related to chromatin immunoprecipitation sequencing (ChIP-seq) or DNA immunoprecipitation sequencing (DIP-seq). But there are options. Labs spoke about their particular challenges with chromatin immunoprecipitation sequencing (ChIP-seq) or DNA immunoprecipitation sequencing (DIP-seq). In the story, two company scientists, Abcam’s Velibor Savic and Cell Signaling Technology’s Chris Fry offer some tips. Here are a few additional recommendations from them. If you like, please tell us about how you tackled your IP-blues or what you suggest labs try. It’s ok if you still have the immunoprecipitation blues. Sharing your challenges with others might help you explore possible solutions. 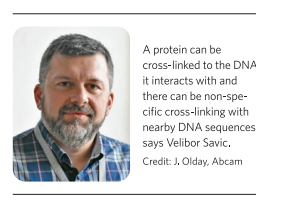 ChIP is an indispensable tool for understanding chromatin structure and then, down the line for understanding function, says Velibor Savic who leads the research and development teams at the antibody company Abcam. The tasks usually involve crosslinking chromatin to fix DNA protein interactions, then shearing followed by immunoprecipitation, then purification and analysis. The pulled-down DNA provides information about where the assayed protein interactions with the DNA in the cell population. 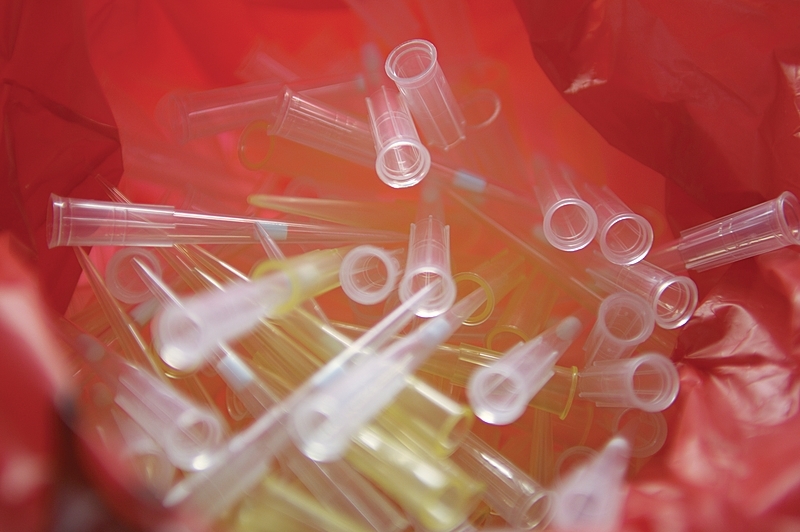 When choosing among ChIP protocols, labs should consider their experiments and numerous variables, says Savic, which include, among other aspects, availability of cells, whether a particular treatment is needed, antibody quality, the crosslinking process, and the choice of downstream analysis--qPCR versus sequencing. Savic says that it matters how input DNA is sequenced via high-throughput sequencing, “since any potential oscillations seen in DNA content,” such as deletions or amplifications would be translated onto ChIP experiments. “This is in particular important when sequencing experiments in new, uncharacterized cell lines or from primary cells,” he says. Controls need to be picked appropriately as well, however, each has its advantages and drawbacks. Using control non-targeting antibodies is a good way, says Savic, to ensure there is evidence of potential non-specific interactions between the experimental antibody and the general chromatin. By using the same antibody isotypes and species, it is possible to establish the patterns of such non-specific interactions, he says, as they will be comparable between the two samples. This, however, would not necessarily address any directed off-target binding by the experimental antibody. In most cases, ChIP is used to compare localizations of different chromatin components relative to one another in a particular experimental setup. When using knockdowns or knockouts, it may be harder to do that, he says, since the biology of knockdown or the knocked-out cells might no longer be comparable to the starting cell pool. “The biological importance of this would need to be assessed individually, on a case by case basis,” he says. Among the many challenges labs face with IP-seq technologies., says Cell Signaling Technology’s Fry, there can be issues with sensitivity due to protein cross-linking during cell fixation and due to the way proteins are denatured when chromatin is fragmented. That makes it hard to detect low-levels of transcription factors and cofactors and hard to detect large multi-subunit protein complexes. And it can be impossible to do assays with low numbers of cells. Specificity issues include high background and thus low signal-to-noise ratios. Specificity issues can indeed sometimes be related to the antibody, says Fry. An assay can also inherently have high background due to DNA sticking non-specifically to beads and tubes. Normalization issues within an experiment can be a problem due to varying efficiency of the immunoprecipitation and the number of steps that can lead to material going missing. That makes “it very difficult to normalize enrichments between samples in a given assay,” he says. There are various ways to normalize histone modifications such as using spike-ins from a known amount of purified chromatin from another species, but he says, no methods exist for normalizing transcription factors and cofactors. 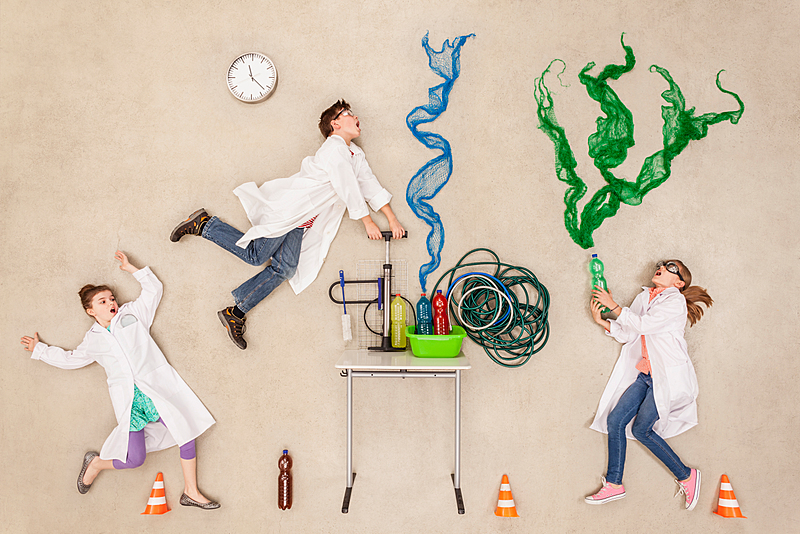 Labs can also face issues with data reproducibility across experiments. It’s the same type of issue as with normalization of samples within an experiment: the efficiency of immunoprecipitation can vary and there is material loss to cope with. Reproducibility issues can also be due to differences in chromatin preparation between experiments. You’re in luck. The antibody you need has been validated for ChIP. It’s certainly seems worth hunting for a ChIP-validated antibody, which are offered by some companies but not all. What’s special about a ChIP assay, says Savic, is that antibodies bind the target in a unique conformation: it’s a “somewhat-native structure but crosslinked to neighboring structures,” he says. Unlike immunoprecipitation and its dynamic interactions with clear on/off rates, in ChIP these interactions are static due to crosslinking and the antibody can’t outcompete them. Depending on the target and the position of the recognized epitope, crosslinking may occlude the antibody binding site, which prevents the antibody from being useful for ChIP, even though it may work well in IP. “Unfortunately, these kinds of issues can only be identified empirically,” says Savic. 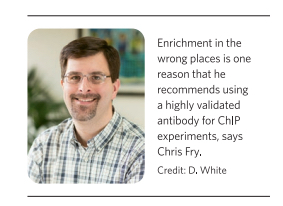 Having a high-quality, ChIP-validated antibody is “key to a successful experiment,” says Chris Fry, who directs epigenetics and ChIP product development at the Cell Signaling Technology. To pass for ChIP-seq, an antibody “must identify an acceptable number of peaks and must exhibit an acceptable signal-to-noise ratio across the whole genome, he says. For determining noise, the team uses input chromatin as the negative control, the chromatin used for the immunoprecipitation, which provides a control for inherent chromatin preparation, qPCR, and sequencing biases that may occur during the experiment. For ChIP-seq, a normal rabbit IgG pull-down is not the ideal negative control, says Fry, because it shows limited enrichment of DNA and adds additional biases that can be exacerbated by qPCR during library construction. Along with counting peaks and determining signal-to-noise ratios, when it comes to transcription factors, the Cell Signaling team looks at enrichment of expected positive gene loci and performs a binding-motif analysis on the enriched chromatin fragments to further confirm the antibody is enriching for the target protein of interest. For histone modifications, they look at expected positive and negative gene loci and perform peptide array analysis to confirm specificity of the antibody, says Fry. These recommendations do not guarantee that IP-seq challenges can be quickly dealt with. But we hope the article and this blog post offer some recommendations for trouble–shooting and that they help to dispel some of those immunoprecipitation blues as quickly as possible.